The best way to learn about our remarkable program is to join our community events! Who: incoming Kindergarten through 5th-grade students from any school who enjoy the outdoors, food and fun. There are spots for 20 kids each week. The teachers are Growing Gardens staff educators with years of experience using school gardens to inspire young minds. When: Monday - Friday 9am-3pm. When you register, you can select the week, or weeks, you would like to sign up for. Week 1 (July 24-28th) for kids K-2. "Little Farmers: Growing, harvesting and cooking". Each "little farmer" will get their hands dirty planting seeds, harvesting the summer bounty and experimenting with cooking healthy and delicious snacks. We will learn about all the plant parts we eat, make garden crafts, explore the tiny creatures that live in the compost bin, sing songs, tell stories, and play lots of active garden games. Week 2 (July 31-August 4) for kids K-2. "Creatures of the Garden: Bugs, Worms and Birds." Come explore the garden ecosystem! Check out a worm bin, make a bird feeder, play lady bug aphid tag and decomposer tag, build an insect hotel, race bugs, visit with pollinators, make "edible insects" out of garden veggies, and tune in to the birds and other creatures that share our garden habitat. Week 3 (August 14-18) for kids 3rd-5th. "STEM and Roots: Science in the garden." Come investigate all the processes that make the garden come alive in the summer. Dissect seeds, dig into the compost bin ecosystem, learn about insect anatomy, test for important nutrients in the soil, design a germination experiment, put on a photosynthesis play, and explore how seeds and plants travel. Week 4 (August 21-25) for kids 3rd-5th. "Let's Cook!" Come make fresh salsa from tomatoes you harvest, make big green garden salads, blend up pesto from garden basil and other greens, and make rainbow smoothies. Learn about how to grow and tend a bountiful summer garden, play lots of fun garden games, and identify and taste vegetables and dishes from around the world. You're invited to an evening of pancake fun to benefit SKG partner Growing Gardens. On April 22nd, Growing Gardens will take over Slappy Cakes, where guests will learn how to make a giant cabbage and noodle-loaded pancake known as okonomiyaki, and munch on farm-direct veggies with miso dip and popcorn with a Japanese twist. Dinner will be topped off with refreshing Japanese shaved ice. There will be two seatings: one at 5:30 and at 8:30. Find more information here. SKG is joining forces with the Chili Committee to bring you a pre-Chili Cookoff Earth Day Celebration the afternoon of April 20th, 2017 in the Garden of Wonders. ​Abernethy parents, students, and families are invited to decorate peace flags, which will be displayed in the garden to commemorate Earth Day. Flags and decorations will be provided in the Gazebo. Join your friends and family from 3-5 pm to take part in the event! 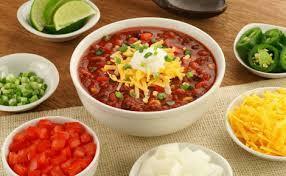 Dust off your ladles, pull out those winning recipes, and get ready to make some chili! The Chili Cook Off is back! Mark your calendars for April 20, 2017 at 6pm and get ready to taste some fantastic chilis and vote for your favorite. For more details and to register as a chef, click here. Abernethy garden & grounds super-awesome work party! 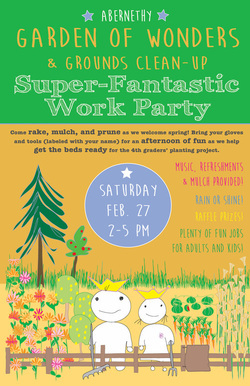 Join us at Abernethy this Saturday Feb 25, from 2-5pm! Parents and teachers are welcome to attend the first School Kitchen Garden meeting of the year! 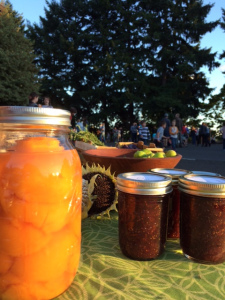 Location: Scout Books — 2130 SE 10th Ave.
Friday Oct 7th from 3:30-6:00pm is our fall SKG event, the Harvest Social. ​This free event for parents and students will celebrate the joy of our garden and the tastes of fall. You’re invited to enjoy fun activities in the garden and gazebo including apple tasting, a scavenger hunt, vegetable printmaking, wheat grinding, and a homemade/homegrown harvest swap! Community Care Day is Saturday, August 27, 2016 from 9:00-12:00. Please come help us make our grounds and garden beautiful for the start of the new year! An invitation to Garden Afterschool Program families! ​We will be having a short but sweet potluck on Wednesday, June 8th from 5-6pm. Students will be showcasing some homegrown and homemade garden snacks, and sharing some experiences from their time in GAP. It's the return of the Abernethy Plant Sale! Searching for that perfect Teacher Appreciation Gift? Get 'em a hanging basket! Want to donate plant starts to the Garden? How about heirloom tomatoes? Click the button below to download the order form and descriptions of all the plants available for purchase. (Hard copies will also be available in the office.) Simply print the form, make selections, and drop off your order form along with your payment (make checks payable to "Abernethy PTA") to the school office by April 20th. Drop by New Leaf Greenhouse's website to see the plants available. Plants will be delivered to Abernethy and ready for pick up Wednesday May 11th. These plants are the same quality that you would find at local nurseries and are guaranteed to thrive! If you have any questions or would like to volunteer for the day of pickup (plant organizing, filling orders, and loading plants in cars) please email Jim Kohler. The annual garden clean-up is this Saturday and we need your help. We have a long list and lots of jobs for everyone. Not only are we pruning, weeding, and raking, but we also need help with some construction projects. Do you have some experience with a circular saw and/or fitting irrigation PVC pipe? Then we need you. Even if you don’t have the experience we can still use your help. We have plans to repair the shed base and build some new garden frames. We also need to prune some fruit trees and the raspberries, weed the beds and rake some mulch. We promise to have refreshments for hard working people and kids. Lisa is going to put a garden party playlist together to rock some tunes while we work! Bring your tools. Bring your kids. Let’s get to work! ​Thank you to all who volunteered and enjoyed an amazing night celebrating Abernethy, the Harvest, friends, fun, and the School Kitchen Garden!